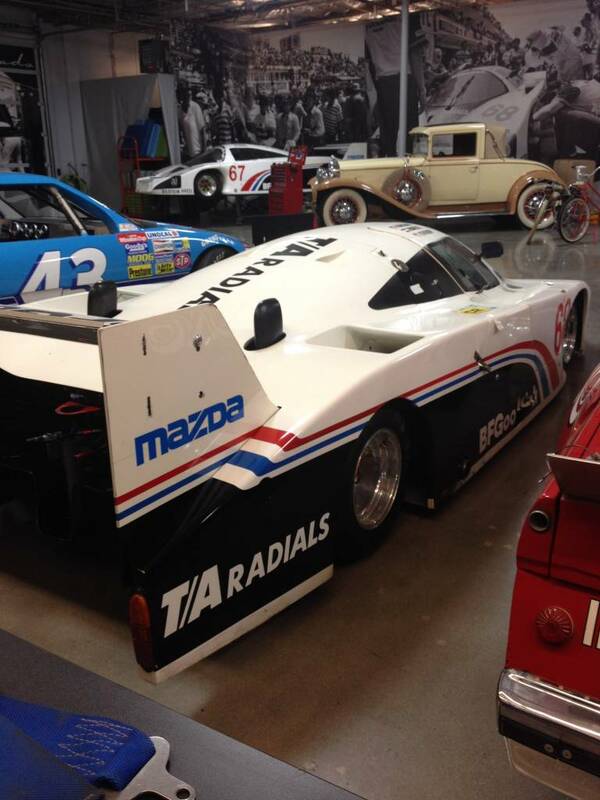 This amazing pair of Mazda-Lola T616 racecars made history when they scored a 1st and 3rd finish in their class at the legendary 1984 24 Hours of Le Mans with their Lola chassis powered by the small Mazda rotary engine. Mazda became the first Japanese manufacturer to score a class win at Le Mans. 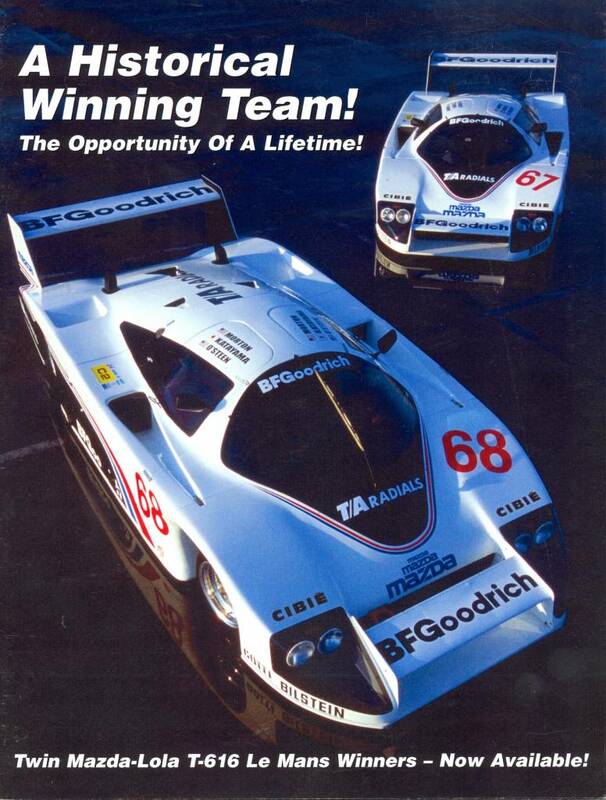 Tasked with running the BF Goodrich team was the seasoned Jim Busby Racing team. Busby himself also served as one of the drivers. British specialist manufacturer Lola was commissioned to design and construct a new prototype racer, suitable to race in both the World Championship and the IMSA Championship. 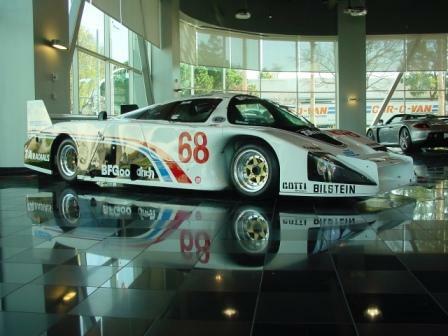 This was a very lucrative deal for Lola as no fewer than three cars were ordered by BF Goodrich. The final piece of the puzzle was an agreement signed with Mazda for the supply of the compact and lightweight Type 13B rotary engine. The two lightweight Lola team cars outlasted the other C2 competitors and defeated the more powerful competition. 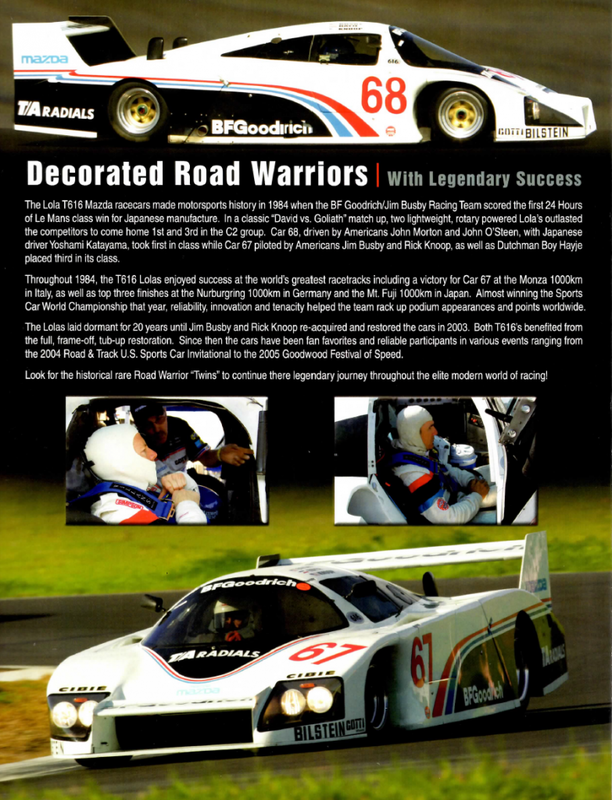 This accomplishment was highlighted by the fact that both cars had run the grueling race on specially developed BF Goodrich Radial T/A street tires. 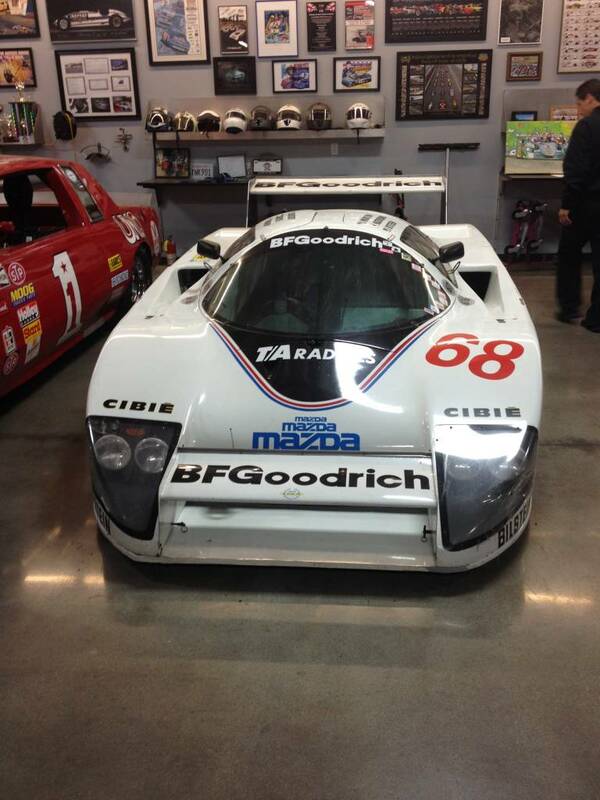 Based on the T600, Lola's original GTP/Group C car, the new T616 was built around an aluminum honeycomb monocoque, which used carbon-fiber reinforcements. The engine served as semi-stressed member of the chassis with part of the load shared by tubular frames that ran from the rear of the monocoque to the gearbox on either side of the engine. The front and rear suspension was through double wishbones with coil springs over adjustable shock absorbers. Ventilated discs with on all four corners. Mounted amidships was a Mazda supplied rotary engine, which was compact, light and relatively powerful. It featured two combustion chambers with a swept volume of 1,308cc, which using the equivalency factor for rotary engines, equated to 2,616cc. To further improve combustion, the twin-rotor engine was equipped with twin-spark ignition. It tipped the scales at just 110kg, yet produced in excess of 300 bhp. 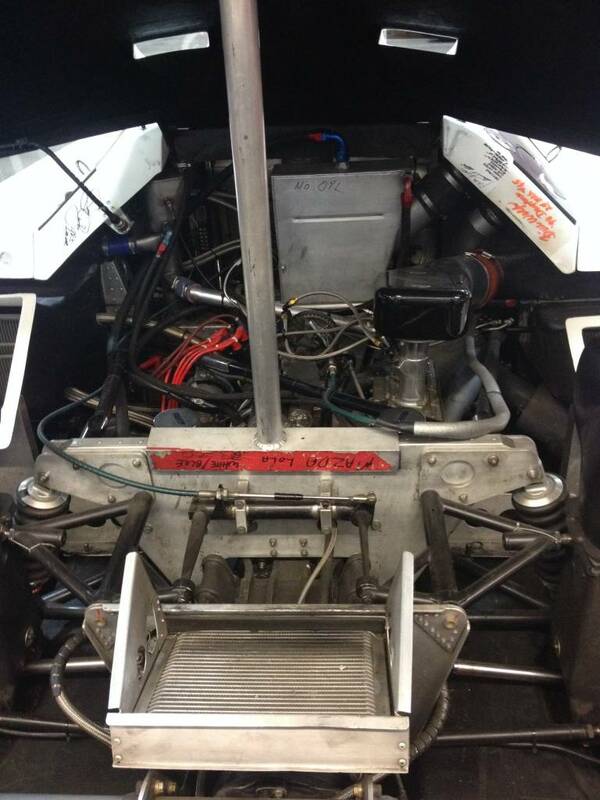 The howling engine was mated to a five-speed gearbox supplied by Hewland. The T616 was clothed in a fiberglass reinforced plastic body that was carefully crafted to optimize the ground-effect aerodynamics. The underbody venturi’s were fed through a large opening between the front fenders. 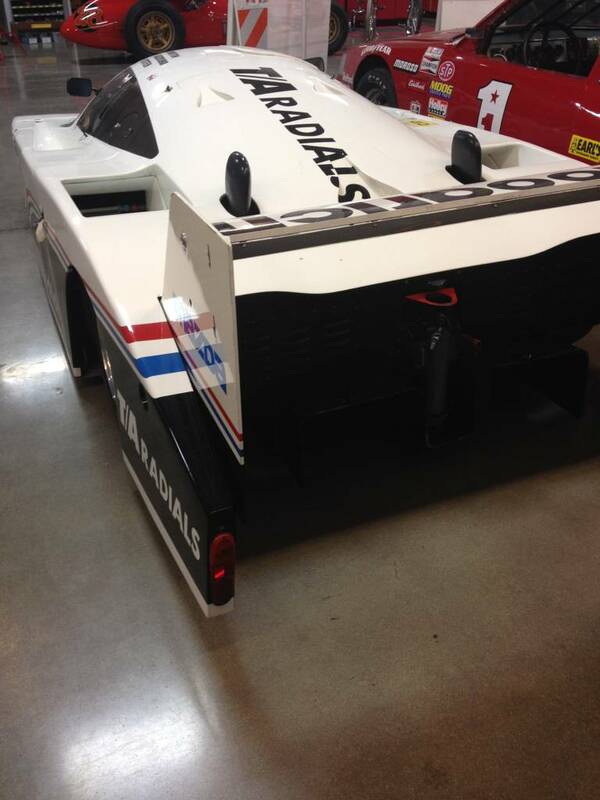 The accelerated air then exited the venturi’s through a sizeable rear diffuser. A small wing mounted above the front air-intake and full width rear wing gave the team plenty of room to further adjust the aerodynamics. Thanks to the lightweight materials used, the Mazda-engined T616 tipped the scales at just 700kg. Taking the class win was Car 68, driven by Americans John Morton and John O’Steen, along with Japanese driver Hoshami Katayama. Car 67, raced by American Jim Busby and Rick Knoop, and Dutchman Boy Hayje, finished third in class. 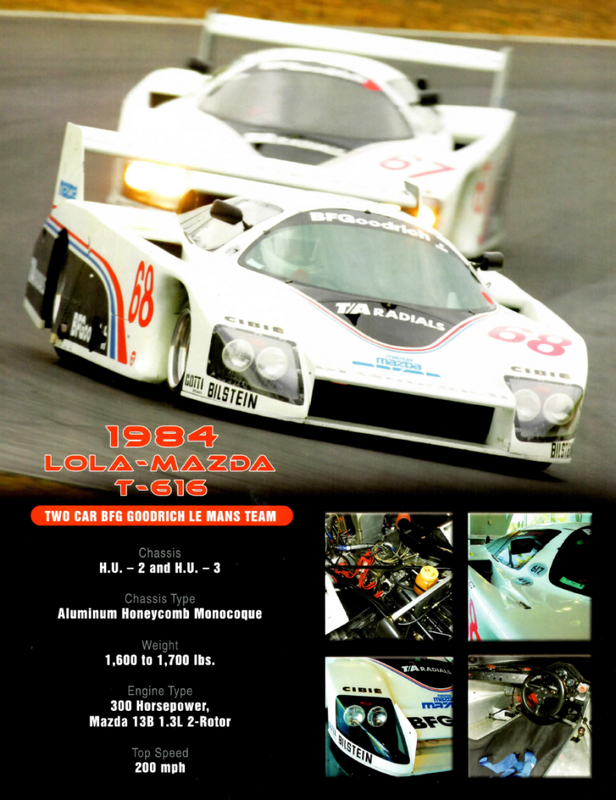 During 1984, the T616 cars enjoyed success at the world’s greatest race tracks. Early in the year, Car 67 claimed class victory at the 1,000 km race at Monza, driven by Jim Busby and Rick Knoop. Later in the year, the cars raced at the Nurburgring in July, and Car 67 finished 2nd in class. Car 67 also finished 2nd in class at the Mount Fuji circuit in Japan, driven by Busby and American Pete Halsmer. Car 68 finished 4th. 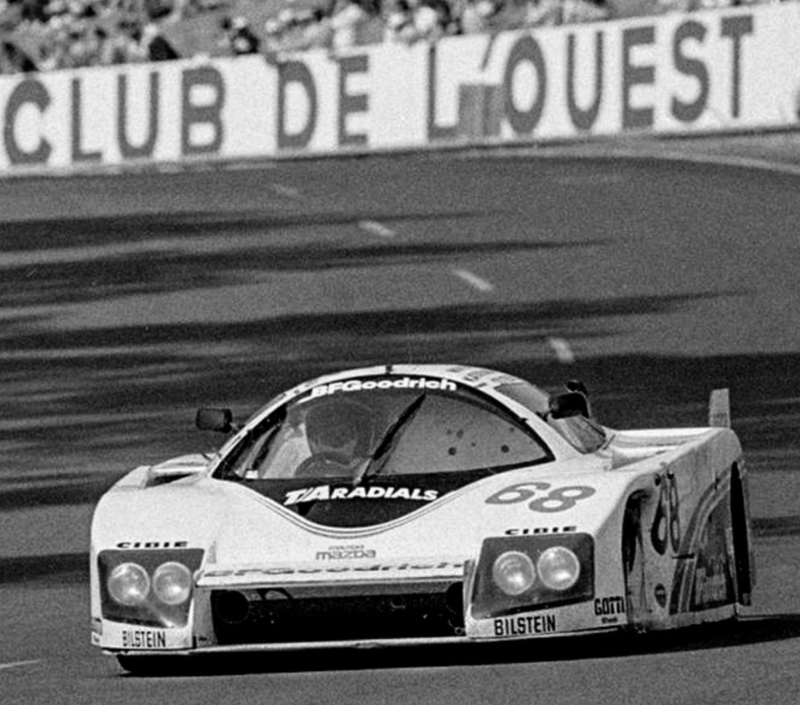 The team almost won the Group C2 Prototype class in the Sports Car World Championship in 1984, coming in a remarkable second in the points. 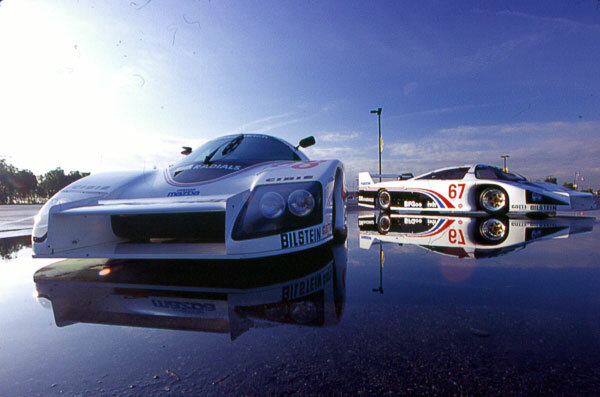 The pair of Lola’s were then sold to independent teams and were raced occasionally until 1990. Both cars were mostly forgotten for the next decade until Jim Busby and Rick Knoop purchased the pair in 2003 and both received cosmetic restorations. 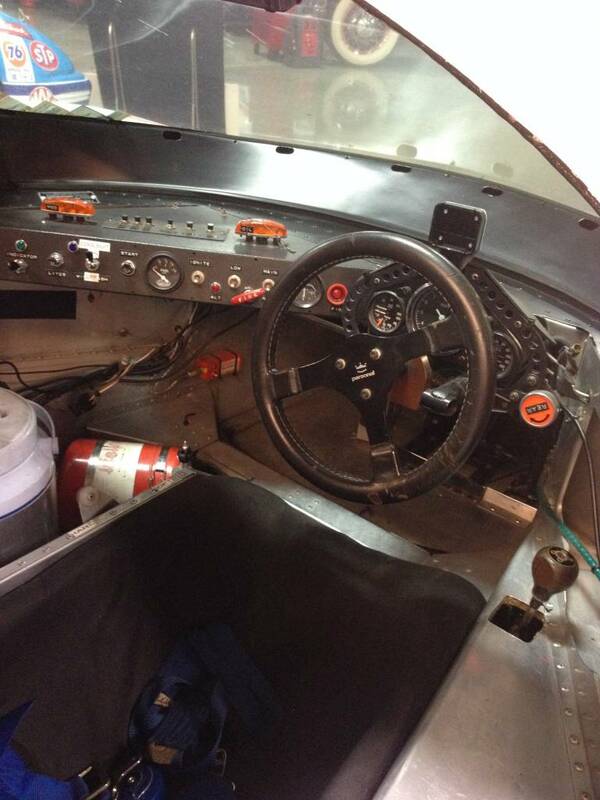 In 2010, the cars’ current owner gave both cars full, tub up, mechanical restorations. Now, both cars, chassis # HU-2 and HU-3 are in excellent running condition and meet the FIA vintage racing specifications and are eligible for vintage racing worldwide. The cars have raced in many historic racing events, including the 2004 Road & Track U.S. Sports Car Invitational, the 2005 Goodwood Festival of Speed, and the Monterey Historics and Reunion races from 2004 onward. Extensive spare parts package are also available for these cars. This package includes 2 spare motors (including the original '84 race winning 13B), 2 sets of tires and wheels for each car, spare nose, tail, roof, and doors to be used as molds for more body parts, multiple gear sets for the Hewland transaxle, rotor casings, clutches, flywheels, A-arms, rings and pinions, rotors, hats, and calipers, CD ignition systems, gaskets and cv boots, and original paint samples. There is also memorabilia, including an original Stand21 racing suit, 3 reproduction team shirts from 1984, numerous posters, prints, and brochures, and a still boxed 1:43 scale diecast model of the #68 BFG Mazda Lola T616.